The school was founded and begun in wartime (1942) and the accepted wisdom is that a lot of the first students came to the Mountains because of perceived greater safety there than in the city at that time, so war in a sense was in the air.The 1943 school magazine has a photo of a Tom Bentley, a past student just out of school then in the Navy with extracts of letters he wrote back to the college from various places overseas…from school to active service with the Navy seems now a too-awful transition but there were many who followed this call. Others mentioned in 1944 are Jack Mathews (Army) G.Medcalf, Peter Westhoff and Frank Collins in the RAAF. 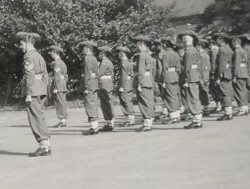 As early as 1945 the College Cadet unit was begun. The Officer was a Brother Mark McCarthy, and cadet leaders were Sgt-Major Tulinsky, Staff Sgt Aaron, Sgts Becker and Smykowsky. The efficiency and organization this group brought to the new endeavour resulted in a commendable level of precision and appearance. By 1946 the detachment had reached a high degree of efficiency and was called upon to provide a guard of honour for religious festivals such as the Feast of Corpus Christi and also for His Royal Highness the Duke of Gloucester on his visit to the area. The year was marked by the Annual camp and a bivouac at Little Hartley where the Baaner family showed them great hospitality. In later years Brother Claude Davis became the Officer in charge of the Unit. He was an extremely charismatic figure and seems to have had a great influence on all the cadets to the point where many joined the Army as a result of his influence. He was the predecessor of Brother Leo who ran the Unit for many years. Parcel arrived at my front door, my address of course and a sender’s name I did not recognise or know. Inside a message: THIS WAS PART OF A MIXED AUCTION LOT IN 2009. I SAW YOUR WEB SITE AND THOUGHT YOU MIGHT LIKE TO HAVE IT Nothing else… And what did the thoughtful sender think we might like to have? The flag of the Cadet Unit of St Bernard’s that so many have marched behind/with for so long. A truly wonderful and welcome surprise! It does raise all sorts of questions…like how on earth the flag (3 foot by 6 foot approx.) came to be part of an auction. Where had it been all this time? Who had had it before including it in an auction sale? How did it come to be in that person’s possession and how long had they had it for? What sort of gracious person would do a thing like this? We did try and thank the sender. We sent a lovely card and a letter to the address on the back of the parcel but it was returned stamped "RTS not at this address". We hope that the thoughtful person who sent us the flag sees this and knows how truly grateful we are for their gift! St Bernard’s had a cadet unit under Brother Leo and I enjoyed the after-school training as well as the camps and bivouacs. The school had a 25 yard rifle range located in the handball courts where we practiced with WWI .303 calibre rifles that had been modified to fire a .22 calibre round. I’m not sure whether my cadet training had any influence directly on my decision some years later to join the army but it certainly helped as I had at least a basic understanding of the military. Incidentally the hand ball played seems to have been what is now known as American Handball and it appears to have been very hard on the fingers and hands. Can’t imagine the authorities allowing it to be played today the same as British Bulldog or Cocky Laura would be frowned upon. Well, a bit about Army life. Bro Claude (the original) started the cadets at SBC, & I was more than happy to be in them from the start, & they continued under Bro Leo. Once I left school, I joined the CMF for a couple of years, before doing National Service. Enjoyed that, so I applied for OCS, Portsea, & went down there in January, 1954. 6 months intensive training, then the School of Artillery at North Head, followed by 2 years at Puckapunyal, training National Servicemen. Then, the Melbourne Olympics were coming, so I was seconded to Military Police, for traffic & crowd control before & during the Games. That was a superb posting, as our Army I.D. got us into any Olympic venue. Then a course at School of Artillery, again, before being posted to A Battery. About this time, I met my wife & we got engaged. While I'd loved every minute of Army life, I knew that my wife was not cut out to be an Army wife - I'd seen the married quarters on offer, & I was pretty sure that my wife-to-be would have organised a mutiny among the other Army wives. But, I was very lucky, as one of the job applications I'd made was perfect as far as I was concerned. While I'd enjoyed Army life, I'd certainly made the right decision to quit when I did. Depending on how you look at it, I was just too late for Korea, & just too early for Vietnam, both by chance, & being tipped out of the Army at age 47, was not an option for me. One of the memories I have of the Cadets at SBC, was to see Charlie Munster, the band-master (? ), tossing the mace up in the air, as he marched in front of the band. It's something you never see these days, thanks to 'Ealth & Safety. But, those days in the Army, starting with the Cadets at SBC, I'm very grateful for. I think you might get a few comments on the article by Ross Murdoch who seems to think the cadets started under Brother Claude. Perhaps it had folded and was started up again by Brother Claude. Actually, however, the SBC Cadet Unit started up in 1945 with Brother Mark McCarthy our C.O., Joe Tulinsky with Sergeant Major and Peter Aaron, Adolf Smykowsky and Ted Becker as Sergeants. I can't remember too much about it. There were about eighty of us and we all froze at night in the camp we went to at Glenfield mid- year - we only had straw-filled palliasses to sleep on. We were issued with old Boer War rifles - 310's but got to shoot with 303's when training at Glenfield. As I remember, the 303'3 only had a 22 bore whether for safety reasons or to make it easier for us to handle the recoil, I'm not sure. I can remember having to be able to recite off pat, "The Duties of a Bren Gunner" and, as well, I think we had to be able to pull the gun apart and reassemble it smartly and know what to do in the event of in the event of its jamming. My Sergeant Major would be able to correct me here! So what do you say Joe? Seeing the article about cadets reminded me of just how much that experience contributed to future interest in things Military. The opportunity to learn about leadership at such a young age would prove invaluable later in life. I joined he CMF ( later renamed Army Reserve) as soon as I could and except for a 10year gap, remained active up until age 63, finally retiring at 65. Enlisting as a private in the Medical Corps, I had a number of postings and promotions. While most of the time was in a part-time Reserve capacity, there were several periods of Full-time service. The longest (8 months) was in 2006/07 as Senior Health Officer, Defence Heath Service, Sydney. As the CO (LTCOL) of this unit, I managed, with a talented team, the health delivery of all the bases across the three services. This seems so far away now, but in 1958 when I joined St Bernard’s College, from my native New Caledonia, I did not know that the Australian Army had a policy of teaching young students the art of warfare. In other words: the Cadets. I suppose that WW2 was still very present in everybody’s mind then and it was considered a good thing that young men learn the Army drills, how to use a rifle, a machine gun, etc. etc. Luckily, St Bernard’s had a very active Cadets unit under the command of Brother Leo, and they accepted me in spite of the fact that I had a French passport! We used to love wearing our Army uniforms, boots and gaiters, but we had to make sure they were perfectly clean, and we used of lot of Brasso to keep our buckles nice and shiny! I don't remember how often we had our "exercices" on the school grounds, probably once a month, but we all looked forward to them, and I have some vivid memories of our band marching around the grounds, ahead of the two or three sections of our Cadets (was Leslie Young, or Michael Carmody, the player of the big drum ??) We took great pride in being much better at marching on tempo, when the occasion was given to parade down the streets of Katoomba, than our Katoomba High School counterparts !!! One day, we are told that we will be going to Singleton Camp, in the middle of NSW, for a week of training amidst real Army guys, to train in rifle firing, etc. etc. The first thing that hit us when we got there by train was the number of flies that would attack our food under our special screens that we wore on top of our Army hats !!! Flies were everywhere, and it was not easy to remain at stand still when they entered your shirt, or your ears!!! And it is in this context, that I want to tell an anecdote that a few Old Boys, who attended Singleton that year, will remember: the baptism of a boy who came from another school, and who had never been baptised!! One night, after dinner, we were gathered inside our tent and we started talking with some other Cadets from other schools, who were also doing their Army training. Rapidly the conversation came around to the fact that we came from St Bernard’s College and that we were Catholics. One of the boys was asking a lot of questions about our religion, and after hearing all our explanations, wanted to know if he, also, could be baptised?? We looked at each other, and remembering what we had been told, probably in Cathechism, that any Catholic could, in the absence of a Priest, and given certain circumstances, give the sacrament of Baptism to a non-baptised person, we decided to proceed with the ceremony ! And this is how, that night, we added a new Catholic soul to our community !!!! Well, at least, we thought we did ! As to the Cadets, maybe I've got it wrong, but does anyone else recall the Drum Major (Charlie Munster???) marching in front of the band, throwing the mace up, then catching it on the way down, never missing a step. I don't think our Health & Safety bureaucrats would approve these days. I remember one time when new uniforms were being issued to the kids and one kid had a real growth spurt during the holidays and needed new bigger shirts, pants, tunic and greatcoat. "Does your tie still fit you?" said the Army instructor who was doing the thing!! It was probably in 1958-59. SBC Cadets were on end-of year Cadet Camp at Holsworthy. We had a Regular Australian Army Sergeant in charge of our drill, training, and weapon practice. During our weapons training and practice we were involved in firing an old .303 rifle in the Army Rifle Range, on Camp. This rifle makes a loud firing noise, and your hearing can be adversely affected. One of our youngest Cadets (no name - no pack drill), had his hearing so badly affected, he could not hear a thing. We were all given 6 bullets to fire...counting aloud each fire. At the end of the firing, we were to carry out "Safety Precautions"...aloud. This young Cadet was in a hearing vacuum, and unaware that he still had one bullet left in his rifle. Our Army Sergeant did what he said later he would never do: he moved from behind the boys firing, to the front, expecting all boys to be finished, and carrying out their Safety Precautions. He had reached our young Cadet...just as he fired his 6th shot, missing by millimetres the leg of our Sergeant! Good old Army expletives were directed at our young Cadet...who could still not hear a thing. Just as well! Our Sergeant, after he had calmed down, readily admitted that he had erred in moving to the front of "a firing line". As if this was not enough excitement for the day...we then moved on to another firing "pit" to fire a Bren Gun. Instead of a Bren Gun, we were informed that it would be an Owen Machine Gun that we would be firing! We were instructed on how we should hold this weapon (a big thrill) and how we should "dig in" with our boots etc. "This Owen will pull upwards...you must avoid this...force the Owen down!" we were told. It was riveting stuff! Our young Cadet eventually stepped forward for his turn. His hearing had not returned. As he pulled the trigger on the Owen it immediately pulled upwards...and continued upwards, in an overhead arch of bullets! We all hit the deck! Including Bro. Leo and our Army Sergeant. All the good old Army expletives started all over again ! Our young Cadet was in a state of shock, eyes agog! Not sure who got to him! We were in a state of shock too! We had seen two near misses, and not keen for "a hat trick"! Attending Cadet Camp was never dull!